Rachael Henrichsen, a California State Licensed Acupuncturist (L.Ac. ), herbalist, Chinese Polestar Astrologer, and founder of Red Gate Path, has been formally studying traditional medicine, internal cultivation, and the arts since 2000. After earning a Bachelor of Arts from the University of Miami she moved to Asia, living Bangkok teaching, and spending time in China and Japan. She began her training in Qigong/Neigong, Taiji, Internal Martial Arts, and I Ching with Master Zhongxian Wu (lineage holder of four traditional schools of internal cultivation practices) in 2005. Her interest and dedication to studying and preserving ancient wisdom traditions brought her to find authentic and dedicated teachers. In 2006 she began a Bön Dream Yoga Study, with Chongtul Rinpoche, abbot of Chong Tsang Monastery in Amdo Sherpa in Tibet. In 2007, she began studying the way of tea (Chado) at the Urasenke Foundation, San Francisco. This Japanese tea tradition is integrated with Zen Buddhism, and has descended from Sen Rikyu (1522-91) She currently holds licenses from Urasenkein Kyoto to practice the Konarai tea procedures. In 2008, she began studying the Chinese Mantic Arts and Almanac Astrology with the late, Liu Ming (the founder or Da Yuan Circle, who during his life, studied and practiced with several accomplished Tibetan and Chinese adepts). Rachael still marvels at the good fortune that led her to be a part of Ming's first and last2-year apprenticeship in Polestar Astrology (also known as Zi Wei Dou Shu or Purple Star Astrology), where she learned to create and read a Chinese Polestar Natal Chart according to the Song Dynasty system of Astrology. Rachael began her study of Five Element Acupuncture and Traditional Chinese Medicine at Five Branches University in 2009, and holds a Master's Degree in Traditional Chinese Medicine. Since 2016, she has been honored to study in a traditional apprenticeship in San Francisco's Chinatown, with Dr. Joseph Ng , one of the first Chinese Medical Doctors to practice in the West and author of Sword and Lute. 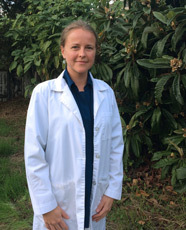 She currently spends her time between her private practice in Santa Cruz, CA and with Dr. Ng at Acupuncture and Associates, in San Francisco, CA. Her other interests and passions include playing the shakuhachi and dizi (traditional Japanese and Chinese flutes), creating meditative artwork, enjoying the outdoors on land and at sea, and tending to her abundant vegetable and herb garden. She lives in Santa Cruz, CA with her partner and kitty.